Preheat oven to 450° F. Brush olive oil on Boboli® pizza crust. Spread Boboli® pizza sauce on crust leaving a 1" border around edge. Add Asiago, cheddar, Parmesan, and mozzarella cheeses. 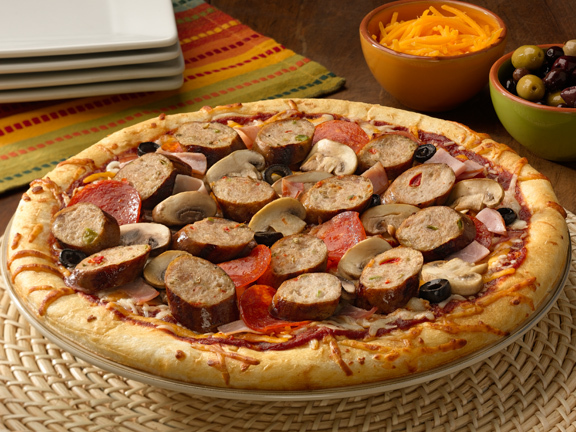 Slice al fresco® Sweet Italian Chicken Sausage into 1/4" pieces and spread over cheeses. Top pizza with ham, pepperoni, mushrooms and olives. Place in preheated oven for 8 - 10 minutes or until crust is golden brown and cheese is melted. Let cool and enjoy!